Buraco, as known as Canasta ou Biriba, is one of the most classic and traditional card games played between famiy members and friends. You play Online Cards in doubles or individually. Use your strategy and overcome your adversaries in this game jam to be the king of the card games. Truco is a casual card game very popular in South America and some regions of Italy and Spain. 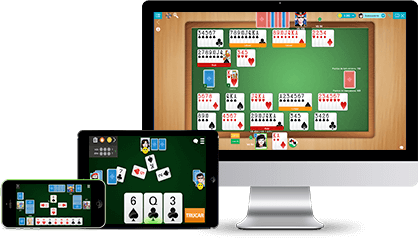 Here you can play Truco Online up to four players. If you have any "manilha" in hands, ask for Truco, raise or simply play the card. Bluffing or playing the Zap (highest card in the game) at your opponent, the important is to have fun and win the round! Poker is a card game played by two or more people, whom bets their virtual credits at a main pot. is considered the most popular card game in the world, very common in casinos, and the one who wins is the one with the best card combination. Play Poker Online with your friends! Internationaly known, Rummy games consists in playing all the cards at the table. Play Rummy Online and form straight sequences from the same suit or three's or four's of a kind from diferente suits. The Buraco/Canasta Games fit this category aswell. A trick's game is the one were sets of card are played each turn, and the same must be collected by the winning or the loosing player of the round, depending on the game. invite your friends and have fun playing Trick's Online here at MegaJogos! The Truco Games integrate this category aswell. The best classic card games can be found here at MegaJogos. Guaranteed entertainment for all the ages, here is every man for himself and Mega for everyone! Challenge your friends at a very fun Online card game. The most played games in Italy were brought to Brazil by Italian imigrants on the 19th century and passed to us from generation to generation. Ideal to make friends, it is a favoloso card game!